When FreeWorship opens you will be able to see the following window. If you are having trouble displaying FreeWorship on your projector follow our step by step guide on how to setup your projector screen. Search through all existing songs in the database using either a title search, lyric contents search, or both. To add a song to the service list double click it in the search results or select it and press enter. To see what songs are currently in the database go to Tools > Manage Database in the toolbar. These tabs allow you to add media to your FreeWorship Service List as Service Items. Here you can see the items in the current service list. Select an item to preview it and then show it on the display. The transition editor allows you to change how slides transition between each other. Transitions currently available include fading, flying, zooming, wiping, covering, uncovering, flipping and splitting. The middle section of the window shows the service item information. 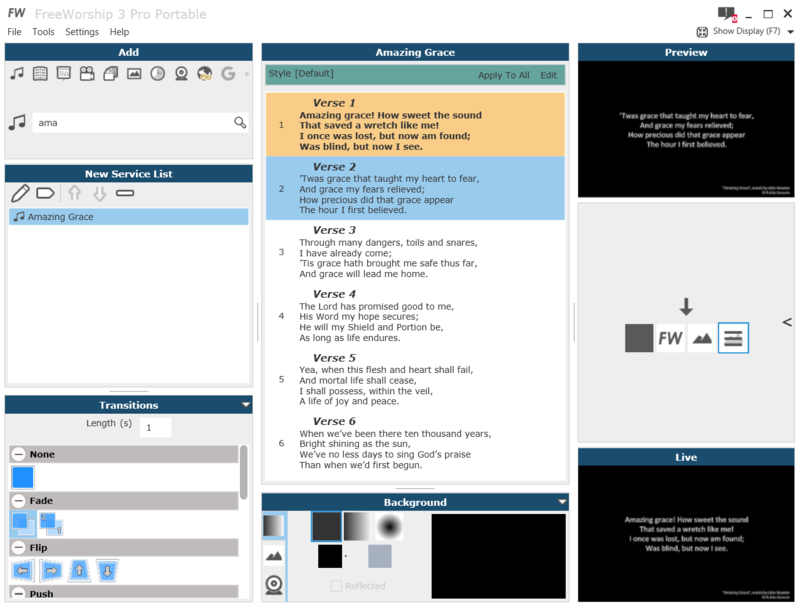 Here you can select which verse to display for songs, control a video or select how many bible verses you would like to display. Here the format of the content can be changed. Change the font and layout settings of the foreground and change the background. The background can be a solid colour, gradient, an image, or a video. One of the most important buttons, this toggles whether the screen is displayed or hidden on your second monitor / projector. By pressing the drop down arrow to the right of the button you can also show and hide the stage display and select which output each display is shown on. The preview window shows you exactly what will appear on the display once you apply it. This means you can setup a new style and change lyrics and see what it will look like before you put anything in front of your audience. The live window shows you exactly what is currently being displayed on the presentation screen.